Here’s the guy who got me through last week. Just when I thought my head was going to explode with all I had to do, I’d look out my window and see him. Sometimes he was looking right in my bedroom window at me from his perch in the hawthorn tree where the berries are red and succulent still. I needed his friendship because it was one of those weeks. My car died, I was out every night doing community work, I was up every day at 5:00 trying to keep up with the writing, and we finally listed my late Uncle Ed’s place with an agent, which meant I was also running over there with plants and bud vases, occasional tables, and a clutch of leather-bound Dickens novels held between two marble bookends. “Make the place look warmer, more lived in” the agent advised us. On my last trip over I threw in three pretty lamps tricked out with soft-pink bulbs. Up and down the stairs of that sad empty place I went. After the last trip, as I pulled into my driveway at dusk here was my friend the squirrel again, in the fir tree next to my car. He knows me by now; I swear he does. 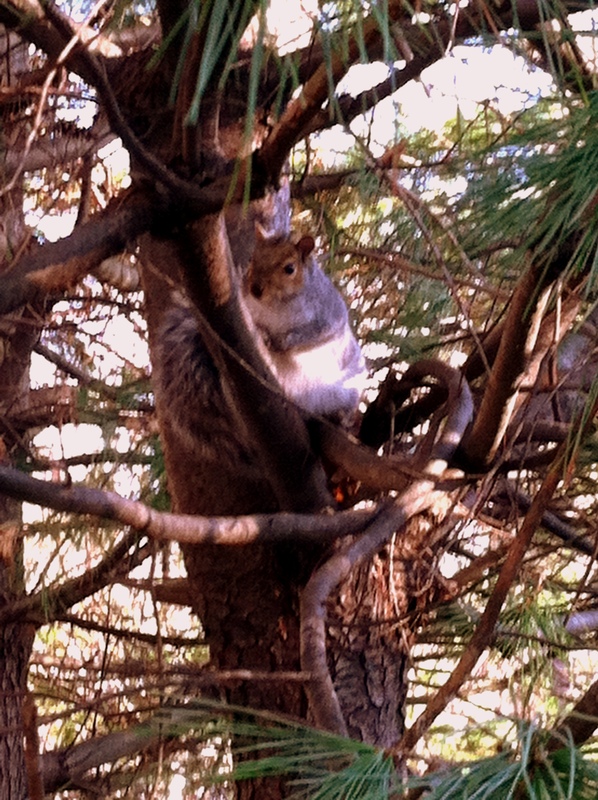 Anyway he regarded me calmly and remained on the branch. When he stood his ground and did not whisk away I thought There’s a message for me here. So I took out my phone and captured the above picture. I did it so I could look at later and try to figure out what that message might be. It’s kind of grainy and imperfect but it got me thinking: Maybe this alert little fellow was meant to slow me down, or at least help me take the long view, though with a week like the one I’d had made my thoughts as fuzzy as this picture. What was the message? 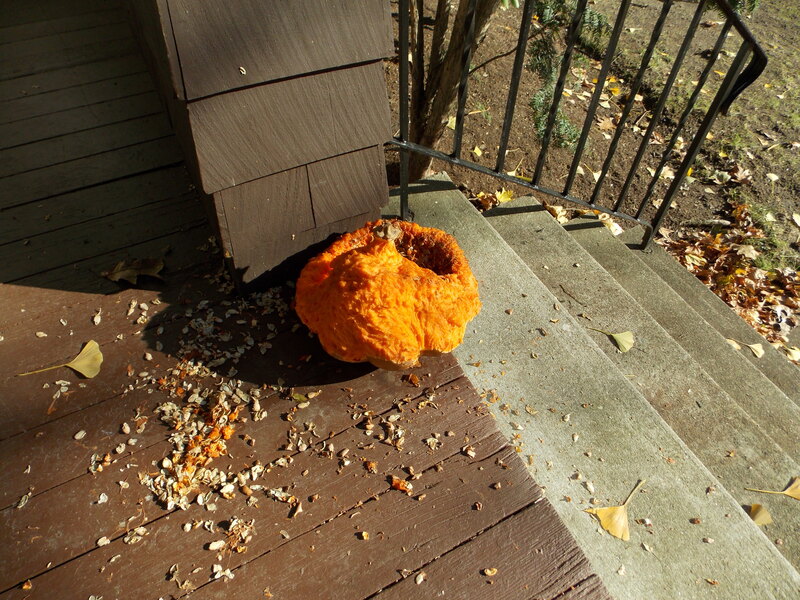 It didn’t come to me until the next morning when I stepped outside to retrieve the paper and saw the once pretty pale-gold pumpkin on the porch now gnawed almost down to a nubbin. The sight just made me smile. He was ‘using’ what was no longer useful to me. Indeed he was surviving on it. Harsh weather is coming for us all as if we could forget that fact with Sandy’s devastation still so much in evidence. The lesson for me? Slow down , savor what feeds me today and be thankful. And so I shall. And so I shall. I have a yard full of there little STINKERS,,,,,,they always are fun to watch,,,,,and they can be trained,,,,,,just start with shell penuts and in no timr they will be takeing them from your hand…..
we were throwing out so much bread and waffles from our quiet freezer when the storm hit. our squirrel is so big we may need to get it a collar and license. he was sitting in (IN!) the mum by our back door the other morning and hitting on the window looking for more hand-outs. during the day when i say out loud to myself, “what’s that noise?” i find my answer in that little plumper who should mix in a few shelled peanuts. Is it dangerous to be kind to them in the peanut-offering way do you think ? I love this post T, reminds me of geese in Orange Park, NJ where I take my daily walks. I talk to them all the time…LOL..love and miss ya!